Important: You should call ahead (or check the farm website/Facebook) the day you're heading out to get the conditions. Also: Wear sunscreen or a hat or both -- because the blueberries only grow about waist high, there's usually little or no shade in the fields. Bringing water is a good idea, too. Blueberries are $4.75 per quart. Indian Ladder also currently has PYO raspberries -- red and black -- for $6.50 per quart. Be sure to call the PYO hotline (the number above) to check on availability. The Berry Farm currently has blueberries and raspberries (red and black). It also has PYO raspberries. "Before venturing into our berry fields, please visit the front register inside the farm store for instructions on picking. Picking containers are provided." Also: "All of our berries are pesticide-free!" Love Apple has PYO blueberries for $3 per pound. It also currently has PYO cherries (sweet and tart), blackberries, and raspberries. Love Apple also offers PYO peaches, which are a little late this year because of the winter -- keep an eye out for them in the next few weeks. Also: Thompson-Finch is a NOFA-NY Certified Organic farm. PYO blueberries start July 11. 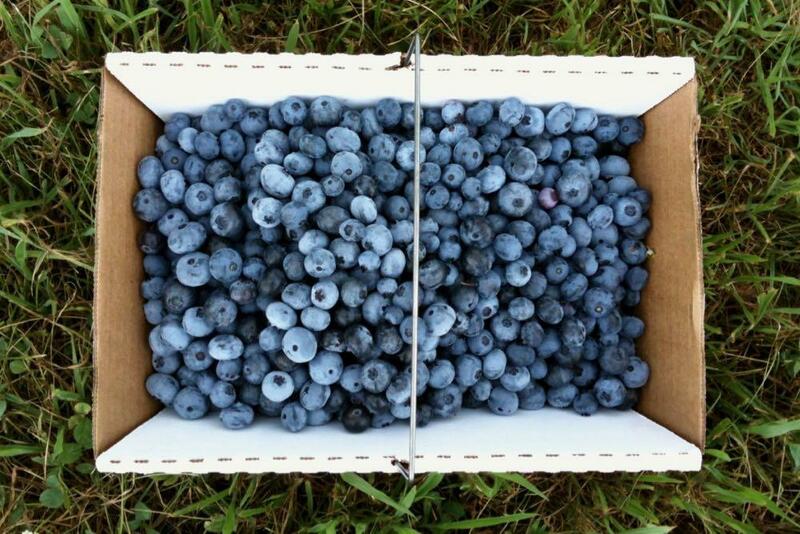 Hayberry grows multiple different varieties of blueberries. Keep an eye on its Facebook page, where the farm posts updates about which varieties are in season. Also: Hay Berry also offers PYO lavender, which we haven't seen anywhere else. The farm is a member of the Northeast Organic Farming Association of New York. PYO blueberries are $4.29 per pound. Keep an eye on the orchard's Facebook page updates. PYO started this week. Blueberries are $2.50 per pound. Eagle's View grows multiple varieties of blueberries that ripen as the summer progresses. Note: cash only, no bathrooms, no pets. PYO season started July 4. Blueberries are $3.10 per pound PYO. We've heard in past years that Winney's grows 19 different varieties (!) of blueberries, and is said to have one of the largest plantings of blueberries in the state. The varieties tend to have staggered harvest times through mid August. Keep an eye on the farm's Facebook page for updates. Hicks started PYO blueberries July 4. The farm grows four varieties of blueberries and the season there typically extends through the end of August. Hicks also has PYO tart cherries, though check ahead because the season is short and is probably ending soon. PYO blueberries are $3.50 per pound. Hand also PYO raspberries for $4.25 per pound. Of course, the farm is also where the Hand Melons are grown. And you've never had one of the melons, you should give them a try. They're fantastic. When the melons become available, usually a little later in the summer, you can get them at the farm stand across from the Washington County Fairgrounds. Stu-Berry was expecting PYO blueberries to start this week (around July 11) -- they'll be $3.25 per pound. Stu-Berry also grows different varieties of raspberries ($4.50 per pound). Check the Facebook page or call for availability. Also: Payment is cash or check only. Know of a good place not on this list? Please share! Picked too many blueberries? Freeze 'em. + Rinse the berries, picking out stems and damaged berries. + Pat the berries dry with a clean towel -- you don't have to get them super dry, but do what you can without smooshing them. + Spread them on a sheet pan, in a single layer if possible, and pop them in the freezer uncovered. Let them freeze hard -- usually 3-4 hours or overnight. + Bag the berries -- most of them will have frozen individually -- in a zip bag or other container, trying to get out as much air as possible. Pop them back in the freezer. + Enjoy months later. The berries won't be exactly like fresh, but they hold up well. And you'd be hard pressed to tell the difference after you've baked them in a crumble or pie, or even make pancakes with them. Fresh blueberries are often delicious just on their own, but if you picked a bunch of them (it's easy to pick too many) and are looking for something to do with all those berries -- crumble them! Head West to Timberlane Farms https://timberlaneblueberryfarm.weebly.com/index.html. It's near Johnstown, ( in Caroga), so it's closer than the listed farms in Granville or Ancram. It's a country place with many varieties planted which helps extend the season to mid to late august. 2nd or 3d generation running the place, original owner still on site is a painter whose art (and some crafts and baked goods) are sold in a quaint barn.